Having been a ‘square’ since round one of my life, I’ve never been too interested in the affairs of those of various and sundry sexual orientations. There are lots of ‘different’ people who aren’t on the same wavelength and/or don’t meet with other people’s approval, but I can’t help that — I’ve got my own problems. My mantra has been: To each his own. Live and let live. Whatever rattles your cage. Etc. You may think the reason I’m writing this is because I have just experienced a sudden conversion and intend to become a zealot for the causes of the transsexual, transvestite, transgendered….etc. Not so. I’m still an old-fashioned, “You go your way, I’ll go mine” kind of gay — er, guy. But issues surrounding the foregoing have come increasingly to the fore in recent years, so I’m finally taking the trouble to educate myself a bit. How much time can it take to see if you can put yourself in the other guy’s/gal’s/gay’s shoes for a moment? They may not fit, but food for thought won’t make you fat. I’m a big fan of old sayings, but even I concede that some sayings could no more pass the proverbial smell test than a rodent could pass a spell(ing) test. They may seem innoscent enough, but smellegant isn’t the same as elegant, and you must admit that a proverb like A turd in the hand is worth two in the tush is less than elegant. Really, close encounters of the turd kind could leave you holding your nose….if not checking your rear-view mirror. That said, are such askew old sayings any less farcical than the twisted tweets America’s Tweeter-in-Chief oft twitters? “Fake news!”…”fake news!”…”fake news!” And if ANYONE can smell (like) a rat when it comes to fake news, it is obviously President Tweety Turd. Leaving the President’s behind for a moment, here are some classic old sayings. Can you make out the fakeout — aka smell the rat — in these venerable gems? If it looks like a duck, quacks like a duck, and mocks like a mocking bird, duck — it’s The Donald. A watched pot never boils….but it may get a bit peeved. A rolling stone gathers no animosity. A fool and his honey are soon parted. Faint heart ne’er won bare lady. Oil and water don’t mix — got that, Slick? You can’t get blood out of a turnip, but you can get honey out of two-lips. Monkey pee pee, monkey do do (easy come, easy go). Dead men tell no tales, but some may leave a will which does. Oh….and I almost forgot this old saying: HAPPY NEW YEAR! Today is birthday of Chinese philosopher Confucius, born September 28, 551 BC (not to be Confucius-ed with Chinese philosopher who long Ago Too Young die like fool, choking on egg). Confucius, of course, left us even more wise old sayings than the inscrutable Charlie Chan, which was pen name of writer called None the Wiser (not to be Confucius-ed with his agent — a gent named Ah So). In any case, in the interest of being fair and balanced and sly as a Fox, we herewith present selection of Confucius sayings to go along with those in CHARLIE CHAN post of Sept. 15. No matter which you prefer, may you benefit from their wisdom, and may all your male children be wise guys. Sad to say, my work here is dumb….make that done. On second thought, maybe right first time. Yesterday, Sept. 29, was CONFUCIUS DAY. Confucius say: Mistermuse perfect pundit to write Sept. 30 CONFUCIUS DAY post because he always a day late and a yuan* short. Mistermuse say: I not a day late, Confucius Day a day too soon — besides, everyone know yuan is actually Spanish/Latino name (as in Don Juan), not Chinese. Latinos say: Whatever. Just don’t Confuci-us with the Japanese, who have the yen. Anyway, before yuan thing lead to another, what counts is the way we Americans say it: “A day late and a dollar short.” USA! USA! USA! Now that we’ve cleared that up, let us get down to the business at hand, which happens to be a selection of profound proverbs by Confucius, followed by an equal proportion of proverbial conclusions by Contrarius (which happens to be the pun name of Anonymous). Choose a job that you love, and you will never have to work a day in your life. He who speaks without modesty will find it difficult to make words good. Man who stand on toilet may be high on pot. Passionate kiss like spider web: leads to undoing of fly. People who eat too many prunes get good run for money. GARBAGE IN — GARBAGE OUT? I consider myself reasonably wise in the ways of the world, but the more I think about it, the more I realize there’s been a lot of stuff going on that I’m not aware of. 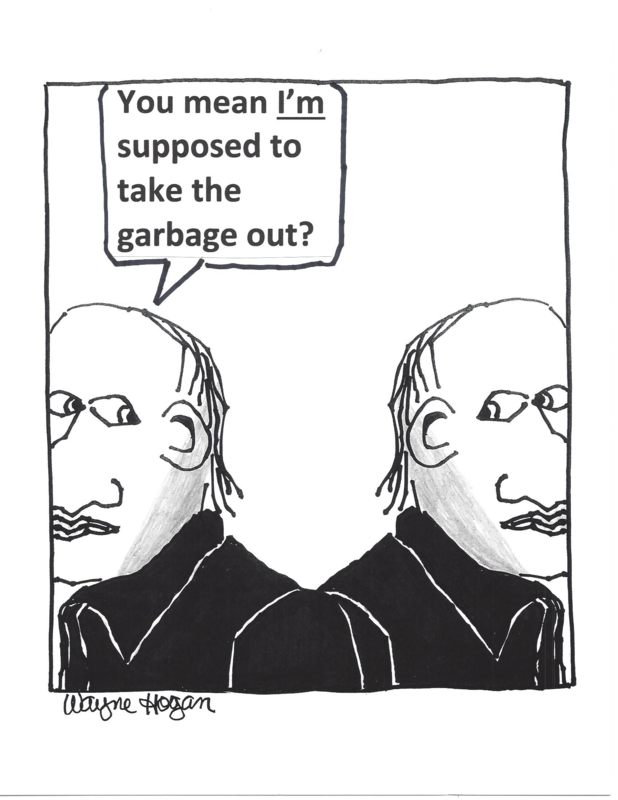 For example, every man-of-the-house knows that he’s the one who takes out the garbage (as my wife is sure to remind me if I forget) — but how does that work when two gays live together? Anyway, the nice thing about writing a post on this subject is that it may be a bunch of garbage, but it’s not like it stinks….and even if it does, what did you expect? It’s not every day that I get to talk trash with imp.u.nity. And who knows what I could win if the awarders of the P.U.litzer Prize get wind of it? It’s clearly a wind-win situation. And with that, my gun — I mean, gum — is losing its flavor, so it’s time to stick it under my chair and call it a day. Lady-of-the-house, where are my nightcap and trail mix? The use of wordplay in the titles of my last two posts (ROMANCE WASN’T BUILT IN A DAY and ALL’S FARE IN LOVE AND FOUR) doesn’t cancel the reservations I expressed in my 6/1/15 post (SAY WHAT? ); i.e., it’s chancy to ‘pun’ old sayings because most people today don’t know them….and if they don’t know the sayings, they won’t get the wordplay. Now, granted that some party-poopers may have known the actual sayings (ROME WASN’T BUILT IN A DAY and ALL’S FAIR IN LOVE AND WAR) behind those titles, but pooh-poohed the wordplay as hardly worth the strain my brain went through to get the end result. Be that as it may, my purpose here is to be ‘test assured’ that my readers are more familiar with once-familiar old sayings than “most people” in the first place — so, if you’re game, here’s a list of 4 old sayings, 4 song titles, and 4 made-up idioms. If you can pick — out of the dozen — 3 of the 4 old sayings, consider yourself a genius. If you get all four right, I will consider you a genius. So, how do you think you did? If you can’t stand the suspense, hold on to your pants, because I will keep you in suspenders no longer — the old sayings are #1, #3, #6 and #12. Speaking of #12, if you weren’t right at least 3 times of 4, obviously you don’t perspire enough to be a genius. In closing, take pride, ye geniuses who passed the test and could dig the rest; let the record show, The wordplay’s the thing.